Its prime central location means that guests can easily navigate the city and unwind in many of Manchester's popular tourist attractions, including Old Trafford, MUSI and the Palace Theatre. Whether you're busy hatching plans or having a team bonding session, you can make yourself at home at one of the many on-site meeting and conference rooms. Mix business and pleasure in one of the liveliest cities in the UK. This was a last minute booking due to a failure elsewhere- very helpful with booking, room was very nice and modern. I have stayed in lots of Accor hotels and this was up there. the check-in process seemed a bit uncoordinated probably largely due to the arrival of a big group on the same day. the room was not ready at 2pm, which was a bit unfortunate since i had arrived already at 10am. apart from that the hotel delivers what one expects of a novotel. the house seems to be a bit older than other locations and some of the carpets in the staircases and halls looked used. the rooms however are up to standard, clean and spacious. the hotel offers a nice small gym and a small wellness area, which was pleasant. Absolutely splendid with just one drawback. The portion of Mushy Peas served with the Fish and Chips was so minute as to be microscopic! Quite a disappointment especially as the North Westt is the home of this dish!! This was a brief trip to Manchester for the weekend; our room was ready upon arrival, clean, comfortable with everything we needed for the one night. The bed and pillows were fine; no outside noise. A good night's sleep. check-in was slow, desk person may have been in training. The coffee took a long time to arrive at breakfast. Otherwise everything was good, we do like Novotel! Great location, efficient and friendly service. Great location, efficient and friendly service. What more can you say. Thanks for another great stay. Perfect location to explore downtown Manchester area. The hotel room was very well equipped with everything you need. Breakfast was very very good. The only let down is the restaurant, serving times are dreadfully long, waiting 1hr on both nights for our food to be served and on both nights the restaurant was just us and another table. The waiting staff didn’t think this was a problem and blamed it on having just one chef. Food was great when it eventually arrived. Other than that great place to stay, just eat elsewhere. It was good and near to the train station but compared to a 4 star hotel it was rather expensive. Experience with two young children was made better by helpful and friendly staff, good facilities and great location. Overall the hotel itself was OK in general but the shower leaked into the main room (room 330) and the floor had to be mopped with towels and we had sanitary products taken from the room by someone and had to raise this as a great inconvenience and complain. The TVs wouldn't work and a technician had to be called to fix them and the USB points at the bedside didn't work either. So overall not a great experience as I have stayed at several of your other hotels and not had as poor a stay. Central location, polite friendly staff over all a very good few days. Good location, right in the middle of the city centre. Excellent staff,friendly and welcoming. Thank you for the birthday treat my husband and son really enjoyed it. Good breakfast choice. special thank you to Steve the breakfast chef. Very polite and friendly. Thank you for the omelette, toast and hard boiled egg Steve. A pleasant hotel with equally pleasant people. 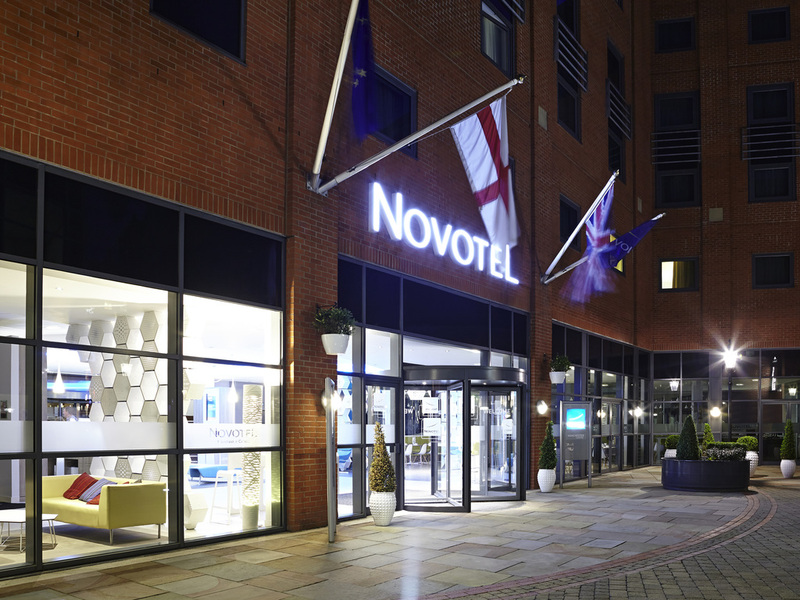 The Novotel is conveniently situated in Manchester and has a good standard of hygiene. For me the downside is the glass wall between the bathroom and the sleeping area, I recognise it has a privacy button which is effective but does not shut out light during the night which leads to broken sleep for the party not using the bathroom at the time.